When the woeful winter weather bestows itself upon us, bringing along with it courageous colds equalling the temperature of the Antarctica (or so we Brits like to think), there's nothing better than locking yourself away, wrapping up in the warmth of a blanket, with a cup of tea and a book in which you can escape for days on end. You wish to write the tale of your very own 'Never Ending Story', with yourself as the protagonist, ready and willing to conquer all that stands in your way. 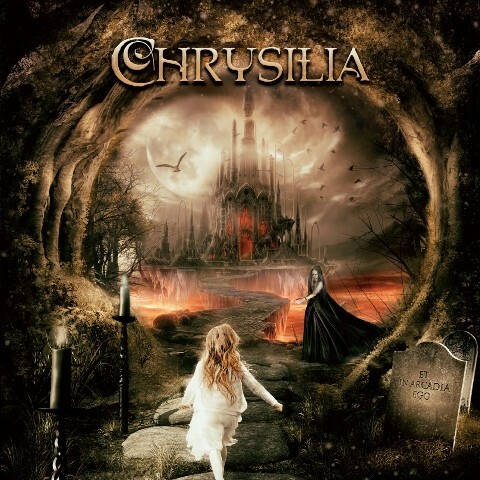 Brewing up this escapists dream, Chrysilia distil their tales of epic adventures across nine bottled-up tracks, ready for your nourishment in the form of 'Et In Arcadia Ego'. A dash of Orden Ogan's epic Power Metal, a hint of Tobias Sammet's song-writing, a drop of Eluveitie's Folk finesse and the essence of audacity and skill that comes only from an accomplished orchestra; these are the secret ingredients which Chrysilia has utilised to bake their debut album, a masterful work that even the veterans of the scene would be envious of. It is around the halfway mark, during 'Arcadia' when you realise you've totally forgotten you're only listening to a record and aren't journeying through mysterious lands on quests unknown, writing tales yet to be told. The complex compositions that make up this ambitious debut will seem simplistic on the first listen, but as you repeat your journey a second, third and fourth time, you'll find yourself lost within the structures, a labyrinth of sounds that become sights that overlap around the inner creases of your mind. The titular track is grandiose, a six-minute instrumental capable of causing seismic earthquakes in your mind as colourful explosions of your imagination take place while violins and keys wage war with Folk traditions. The eponymous track is a magical menagerie of beautiful sounds; violinist Odysseas shining as bright as the stars the music soundtracks, complementing the mesmerising vocal performance of Chryso, who is one half of the visionary team, along with Elias Pero, behind the ambitiously dexterous display that washes over us throughout the album. Twisting the traditions of Folk and Classical together in a tornado of Symphonic Metal, Chrysilia have crafted the tale Nightwish have been struggling to tell for all of their existence, and yet, this is only their first foray into storytelling. Simply put, this is a masterpiece.